During most of his 16-year stint with the Buffalo Bills, Russ Brandon has treated the completion of the NFL draft like the last day of finals, going straight from the team's Orchard Park, N.Y., training facility to a nearby restaurant and enjoying some celebratory munchies and cocktails with scouts, front-office executives and significant others. A good time is usually had by all, but Saturday night's gathering was especially fulfilling for Brandon, the CEO and president who last Jan. 1 was given full authority over the team's operations by 94-year-old owner Ralph Wilson. After identifying and landing a potential franchise quarterback while somehow maintaining the element of surprise, the Bills brought in a cast of supporting actors he believes can help get his playoff-starved franchise closer to the big stage. From Brandon's perspective, the plan implemented by general manager Buddy Nix couldn't have played out more perfectly. And in an era of increasingly intrusive probes for information – just ask Nix, who last month was tricked into having a phone conversation with Tampa Bay Buccaneers counterpart Mark Dominik that ended up on a popular sports website – Brandon's commitment to clandestineness hit particularly close to home. "There's so much awareness, so much coffee talk and so much false information out there, and I always get a kick out of it," Brandon said via telephone Saturday night during a short break from the post-draft festivities. "We really try to be an organization that sticks close to the vest and stays under the radar. "So many people get involved in trying to figure out who's picking who, and that passion is what makes the game so great. My kids didn't even know what we were going to do. I told them, 'That's the way we roll.' "
The secrecy paid off for the Bills, who picked up a pair of extra selections (in the second and seventh rounds) from the St. Louis Rams after trading down eight spots in Thursday's first round. When they took former Florida State quarterback E.J. Manuel 16th overall, it was a surprise to virtually everyone outside the war room. 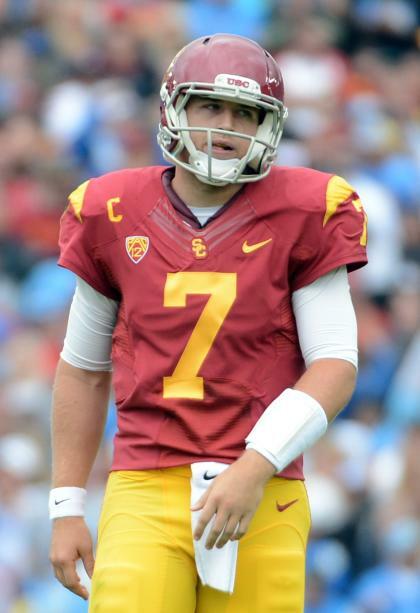 The Bills had conducted private workouts with five quarterbacks, and various reports linked them to Syracuse's Ryan Nassib, West Virginia's Geno Smith and USC's Matt Barkley. Nassib, who'd played for newly hired Bills coach Doug Marrone at the 'Cuse, was presumed to be the leading candidate. Yet it was Manuel, a 6-foot-5, 237-pounder long on potential, who Brandon, Nix and Marrone agreed they had to have. The Bills could have played it safe and taken Manuel eighth overall, but with the Rams eager to land West Virginia wideout Tavon Austin, an enticing gamble presented itself. Buffalo, which had only six picks heading into the draft, could pick up two additional selections by trading down with St. Louis. Austin, according to a Rams source, was "at the top of [the Bills'] draft board, but they didn't want to take him. And they knew the Jets [picking ninth overall] wanted him. So, they could take their guy and risk facing [Austin] twice a year, or they could make the trade and get him out of the division." The Bills did the deal, dropping down to 16 and sweating out the next eight selections. "Buddy was comfortable that we could make the deal and still get what for us was the ultimate prize," Brandon said. "It's always a little bit nerve-wracking in those situations. You can do all the recon you want, but as you know, everybody's lying to everybody anyway this time of year." 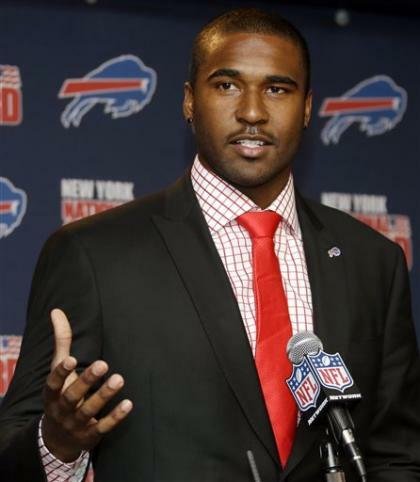 Once the team landed Manuel, the Bills had accomplished a prime objective. "Our goal coming in was to bring in another bell-cow quarterback to compete for the job [with newly signed Kevin Kolb and holdover Tarvaris Jackson], and we did that with E.J.," Brandon said. "Then we added some new tools in the toolbox." On Friday, Buffalo drafted a pair of receivers, USC's Robert Woods (second round) and Texas' Marquise Goodwin (third round), who'll team with flamboyant wideout Stevie Johnson for what should be a significantly upgraded passing attack. In between those picks, the Bills used the second-round selection they got from the Rams to snag Kiko Alonso, a versatile linebacker from Oregon who'd been rising on many teams' draft boards. More defensive help arrived on Saturday with the selections of safeties Duke Williams (Nevada) and Jonathan Meeks (Clemson) in the fourth and fifth rounds, respectively. Kicker Dustin Hopkins, a Florida State teammate of Manuel's, and Arkansas tight end Chris Gragg rounded out the class, at which point the team scrambled to sign undrafted free agents, a process Brandon likened to Wall Street trading. Then, at last, it was time for Brandon and his front-office employees to unwind and congratulate one another on a job well done. They're not alone, of course. The reality is that 32 teams got better over these past three days, but the NFL is a zero-sum game, and 16 of them will lose on any given weekend. With a league-high 13-year postseason drought (dating back to the infamous Music City Miracle), the Bills understandably provoke a healthy share of skepticism from fans and media analysts alike. For what it's worth, their CEO is convinced his franchise took some big steps toward respectability these past few days. "We're thrilled with the way it worked out," Brandon said, and for the first time in awhile, he seemed to be telling the truth. • Matt Barkley and friends had a rough draft, but we should have seen it coming: After two nights and three rounds of excruciating neglect, Barkley finally got the lifeline he so badly needed Saturday, with the Philadelphia Eagles trading up with the Jacksonville Jaguars to take him with the first pick of the fourth round. Heralded as a likely top-five selection before electing to remain at USC for his senior season, Barkley suffered perhaps the most devastating draft freefall in modern NFL history. 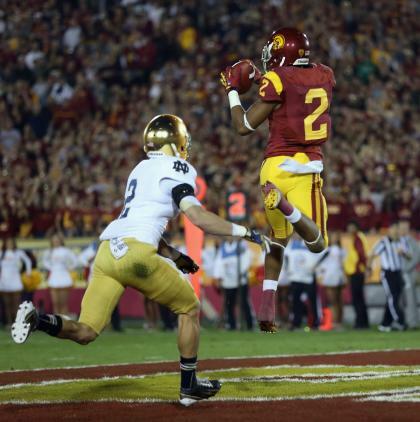 Yet if the young man's spirits were dampened, he did a tremendous job of hiding his disappointment on Saturday night. "I know it will be great!!!!" Barkley said via text message in regard to joining the Eagles. "Time to make history." I'm going to go on record right now in expressing my agreement: I believe Barkley will be a highly successful NFL quarterback. The kid has an edge, and I believe he has an it factor, though I concede that plenty of NFL coaches and talent evaluators don't seem to share that assessment. And with only Manuel, Smith and Mike Glennon selected over the first three rounds – the worst showing for QBs since 2000 (Chad Pennington, Gio Carmazzi, Chris Redman) – it wasn't just Barkley and Nassib (who went later in the fourth round to the Giants) getting dissed. In reality, the devaluing of this quarterback draft class (save Manuel) began long before Thursday. It started with the Eagles' surprising decision to re-sign Michael Vick, continued with the Kansas City Chiefs' trade for Alex Smith and extended to the Raiders' trade for Matt Flynn and subsequent dealing of Carson Palmer to the Cardinals. In the end, the Cleveland Browns were content to roll with second-year quarterback Brandon Weeden (and newly signed backup Jason Campbell) while the Jags stood pat with Blaine Gabbert and Chad Henne. On paper, that sounds dubious, but those franchises are being run by new regimes that don't feel instant pressure to succeed and thus can wait a year to address their quarterback situations. And the "Biff For Bridgewater" drumbeat can now begin in earnest, with the Browns and Jags joining the Raiders and New York Jets among the early pack of favorites to get the first overall pick in 2014. • Manti Te'o landed on his feet, but please don't compare him to a fallen warrior: After all the negativity surrounding the former Notre Dame linebacker in the wake of his lousy BCS national championship game performance and subsequent catfishing saga, his selection in the second round by the San Diego Chargers Friday gave him a solid shot at NFL success, especially given that he'll play in a relatively laid-back media market. That said, Te'o should do everything he can to escape the shadow of the late, great Junior Seau, perhaps the most beloved player in franchise history. 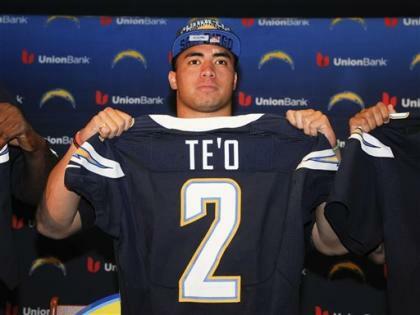 At his introductory news conference at the Chargers' training facility Saturday, Te'o conceded that he'd idolized the future Hall of Fame linebacker while growing up in Hawaii, telling reporters, "It starts off with Junior. Me being a Polynesian-Samoan kid, you look up to Junior. He's a Samoan man who was a trailblazer for kids like me." And if Seau were still with us, I think he'd tell Te'o: "Buddeeeee – blaze your own trail, and keep it real." Then Junior would stick him with a massive tab at Japengo and make him feel special in the process. • Chargers' new regime tried to make an old-school splash: I spent some time on Saturday with the great LaDainian Tomlinson, who after having spent his final two seasons with the New York Jets, signed a one-day contract with the Chargers and staged a retirement ceremony last June. And I learned something rather surprising: Tomlinson, who'll turn 34 in June, was recently offered an opportunity to rejoin the Bolts this season in a very real capacity. "I met [new general manager] Tom Telesco and [rookie head coach] Mike McCoy at the [NFL scouting] combine, and they asked me to come back and play," Tomlinson said. "I saw [executive vice president] John Spanos at a restaurant in Indy, and he introduced me to them, and they brought it up. At first I thought they weren't really serious, but they kept talking about it, and I realized it was real. They said, 'You can come back and carry it 10 or 12 times a game. We'd like to have you here.' " Though flattered, Tomlinson said he didn't seriously consider the offer: "No, because when I made the decision to walk away, I wrestled with it long and hard, and I knew it was final. Once I retired, that was it. My mind is in a different place. Mentally, going back would have been too hard." • Niners continue to flex their muscles: In fact, you might call the reigning NFC champions Bostonstrong after Friday's selection of Rice tight end Vance McDonald in the second round, a move that could allow San Francisco to feature a Patriots-style, two-tight-end passing circus. Already armed with a top-shelf tight end in Vernon Davis, the Niners got a potentially scary complement in McDonald, a smart, athletic, multi-dimensional threat who'll allow brainy offensive coordinator Greg Roman to get even more creative. After trading up to land safety Eric Reid in the first round, the Niners could have stood pat and selected former Stanford tight end Zach Ertz with the second pick of Friday's second round. Instead, they traded down, taking McDonald 21 picks later. Roman and head coach Jim Harbaugh would have been happy to have Ertz, who played for them at Stanford and was the second-rated tight end (behind Notre Dame's Tyler Eifert) on most draft boards. The guy they really wanted, however, was McDonald. Something tells me the Pats' killer tight end combo of Rob Gronkowski and Aaron Hernandez may soon have a viable rival on the West Coast.